With great aspirations to grow out your beard and being inducted into the high profiled “beard gang”, there a few things to keep in mind to make sure your beard fits the bill. Basically, your beard will have to be treated with just as much TLC as is given to the hair on your head. Regular trimming, conditioning and moisturizing are all a part of this process. And to make this process less burdensome, you’ve got to have the right product to achieve maximum beard bliss. 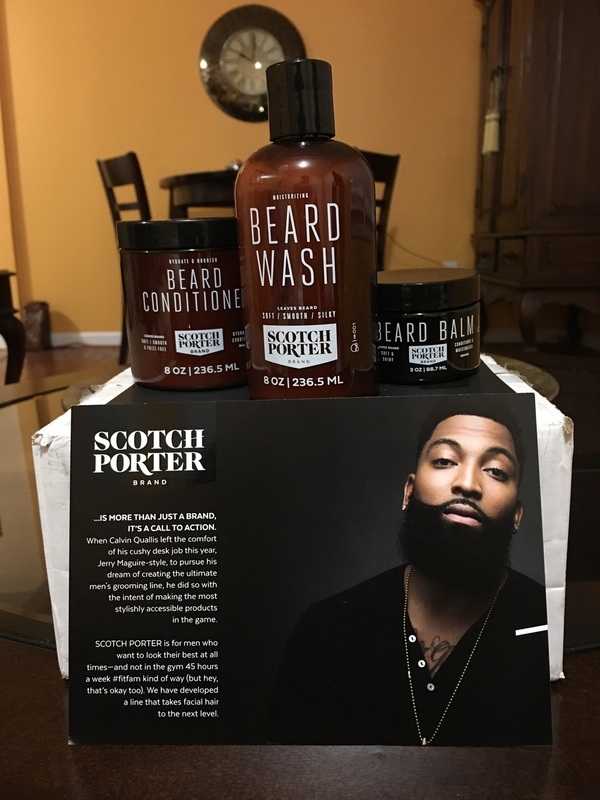 Let me introduce you to the phenomenal Scotch Porter Brand, which I had the opportunity to do a promo ad for on behalf of Urban Lux Magazine’s Winter 2016 Issue. This moisturizing beard wash is sulfate-free, all-natural and an easy lather to massage into your beard while you're in the shower. Honestly, I’ve never used anything besides soap on my beard for fear of using a product that would be too harsh on the face. The Beard Wash after using a few times a week along with the conditioner, seemed to enhance the shine of my beard leaving it softer to the touch and more manageable to groom on a daily basis. My first impression of the beard conditioner is the aromatically sweet smell that you get a whiff of when you take the top off. The melange of botanical products infused together including Marshmallow Root, Chamomile Flowers, Shea Butter, Jojoba Oil and more are what make this product a must-have. The beard conditioner is to be worked thoroughly throughout the beard following the rinse of the beard wash moisturizer and left in for 2 - 5 minutes prior to rinsing out. The finale to this trio of beard products is Scotch Porter’s Beard Balm. Comprised of some of the same ingredients found in the beard conditioner and beard wash, this light, but creamy balm does not require a heavy amount to do the trick. With just a small dab spread throughout your damp beard, this balm proves to leave the beard silky, dark and soft. Not only that, but I’ve noticed in just a little over a week of using, that this balm seems to accelerate growth and thicken the beard to give an overall fuller look.